You can admit it. Kids worldwide have been wanting to ride a dinosaur since 1993. Well, we're sure some did before that too, but it wasn't until Steven Spielberg's Jurassic Park captivated audiences worldwide that the possibility actually seemed like it might not be so far fetched. Now, we sure don't have cloning technology of that capability yet (at least that we're aware of) so the chances of actually seeing a dinosaur walk the Earth again are incredibly, incredibly slim. But, whether you're one of the kids who got to see Jurassic Park in it's first run, or if you've just got a kiddo with the ultimate wish of riding a dino... you can finally make their (and your) dreams come true. With this Kid's T-Rex Piggyback Costume! 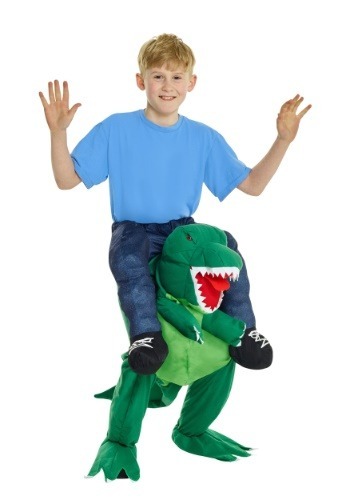 This awesome plush costume makes it look like your child is riding a pint-sized dinosaur. (And if it's actually you who has the big time dreams of dinosaur riding, we also sell an adult version!) With soft-sculpted dino details and an easy fit comfort elastic waistband, this costume is sure to become an instant favorite. This costume comes in one size fits most, but check the measurements against your own child's inseam to ensure proper fit. Equally suited for both boy and girl dino-adventurers, get this signature costume for your kiddo to really make their dinosaur dreams come true!